Inflammatory and degenerative illnesses of the locomotor system: Rheumatoid arthritis, Osteoarthritis,Podagra,Arthritis caused by Reiter syndrome,Neurological amyotrophy,Juvenile arthritis. Voltaren Emulgel contains the active ingredient diclofenac. Diclofenac - steroidal antiinflammatory drug, a derivative of phenylacetic acid. The drug has anti-inflammatory, analgesic and antipyretic some action. Due to inhibition of the activity of both isomers of the enzyme cyclooxygenase drug violates the synthesis of prostaglandins from arachidonic acid. This reduces the amount of prostaglandins in inflammation. When applied topically, the drug has analgesic, anti-inflammatory and anti-edema effect. Use of the drug in trauma promotes regeneration of cells of the connective tissue of the joints and ligaments, leading to faster recovery of damaged muscles and tendons. In addition, a water- alcohol based drug Voltaren Emulgel helps cool and development of anesthesia in some application. 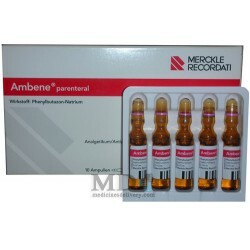 The drug is poorly absorbed into the bloodstream when applied topically, usually adsorbed not exceed 6%. The total amount of diclofenac in the blood application area proportion of the drug. Using the drug Voltaren Emulgel under occlusive dressing adsorption of the drug increases 3 times. After entering the systemic circulation, diclofenac binds well to plasma proteins, mainly albumin ( degree of binding up to 99%). When applied topically, diclofenac concentration in synovial fluid is significantly higher than in plasma. Metabolites of diclofenac significantly less active than the diclofenac. Half-life of 1-3 hours. Excreted in the urine and bile, along with the feces. Bursitis, arthritis, periarthritis, tendonitis, and other forms of soft tissue rheumatism. For the symptomatic treatment of pain, swelling and inflammation caused by injuries of ligaments, muscles, tendons, which are obtained as a result of sprains, strains, bruises. For the treatment of sports injuries. For the treatment of patients with osteoarthritis of the joints of the spine. The drug is used in adults and children over the age of 12 years. 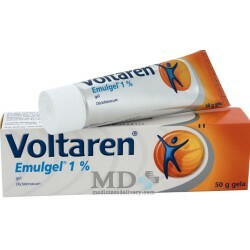 Voltaren Emulgel is applied to clean, dry skin with a thin layer 3-4 times a day. The course of treatment determined by the attending physician, however, is not recommended for continuous use of the gel more than 2 weeks in patients with lesions of soft tissue and more than 3 weeks, with the defeat of the joints. Before and after use of the drug should wash their hands is not recommended to avoid getting into eyes. If, within a week from the beginning of the use of the drug is observed positive dynamics, it is necessary to inform the doctor. No dose adjustment is required in the treatment of patients older than 60 years. Due to the low degree of absorption of diclofenac in the systemic circulation, the risk of systemic side effects is small. However, it is rarely possible to develop bronchospasm and allergic reactions. Among the most common allergic reactions when using diclofenac note: itching, rash, allergic dermatitis. In rare cases may develop angioedema and photosensitivity. The appearance of side effects, one should inform your doctor. 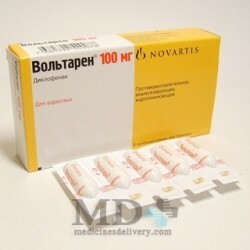 The drug is contraindicated in patients who have individual sensitivity to the drug and analgin. The drug is not prescribed to patients with a history of bronchospasm, allergic rhinitis and urticaria caused by the use of dipyrone. The third trimester of pregnancy. In the first and second trimester of pregnancy, the drug is prescribed as a last resort if the expected benefit to the mother is higher than the potential risk to the fetus. 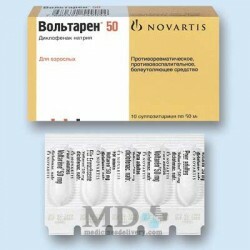 In the third trimester use of the drug Voltaren Emulgel contraindicated, as well diclofenac crosses the placental barrier and can cause developmental disorders of the cardiovascular system of the fetus with a long gestation. The drug is not recommended for use during lactation. In the appointment of other non-steroidal anti-inflammatory drugs should exercise caution and carefully calculate drug doses. Due to the low systemic absorption of interaction with other drugs drug Voltaren Emulgel is not revealed. When used according to instructions overdose is unlikely. If you accidentally taking the drug orally indicated gastric lavage, and receive chelator. Treatment is symptomatic. No specific antidote. Gel for topical application of 1% to 20 g or 50 g in a tube, 1 tuba in a cardboard box. Gel for topical application of 1% in 100 ml container, 1 container in a cardboard box. The drug should be stored in a dry place at a temperature between 15 and 25 degrees Celsius. Diclofenac gel Diklak, Diklobene, Dikloberl, Olfen.